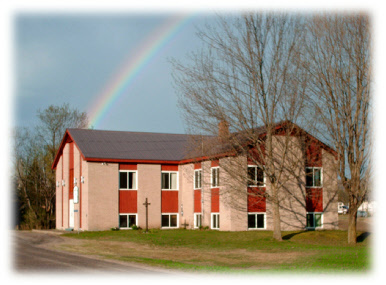 Beginning in 1961, services were held for a number of years in homes and in the Community Centre before the chapel was built in 1967. From time to time we are asked about our denominational affiliation. When we answer that we are biblical Christians with no denominational connection some find it hard to imagine. We do not report to, or receive instruction from a head office anywhere on earth. We endeavour to follow the pattern of the New Testament churches. The New Testament is our manual of operation. It is also our source of doctrinal belief. Of course we are registered with the government as an official charity and report to them for accounting purposes. We are subject to government audit, to which we gladly submit to demonstrate that we are financially above board. Because we take no denominational name anyone is welcome to attend our services. We are also free to fellowship with others of varying background who value biblical doctrine and practice.